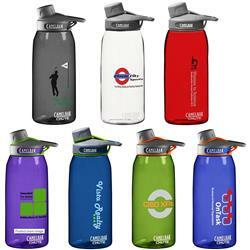 Perfect for any sports promotional event or for resale in your store, the CamelBak® 1L ChuteTM Bottle is fully customizable to fit your needs. This sports bottle features a leak proof cap, a go anywhere 2 finger carrying handle, rapid refill tether design and a high flow, ergonomic spout. 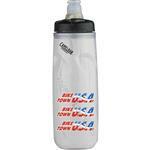 Durably made with BPA Free material, it can be personalized with your company name or logo. Other CamelBak and Chute styles available. Dimensions: 22" x 20" x 11"